Westone’s W40 offer supreme clarity, ravishing detail, and astonishing dynamic expression, placing them in meager company within the hi-fi landscape. Storied audio company Westone boasts an expansive auditory catalog, supplying everything from in-ear monitors for musicians to custom made noise-attenuating earpieces for jet pilots. 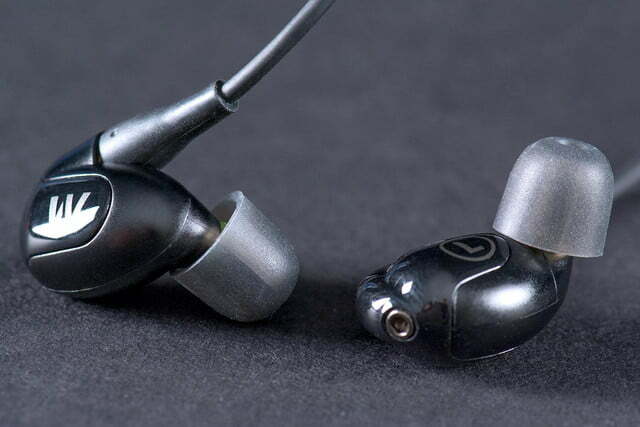 But it’s Westone’s impressive new line-up of consumer in-ear headphones that’s been catching our attention lately – including the top-tier W60, which packs a ridiculous six-armature arsenal into each tiny earpiece. We got our first listen to the W60 at CES 2014, and it offered one of the most incredible portable audio experiences we’ve ever had, handily winning our Best of CES 2014 award in the headphones category. But the W60’s premium tones also fetch a seriously premium price; $1000, actually, which places them in a very narrow niche. 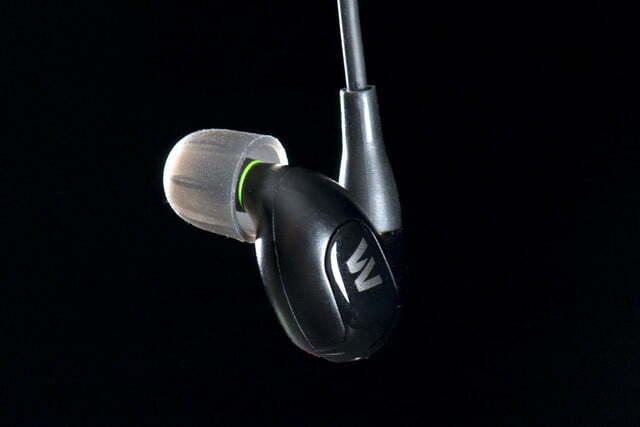 Inciting slightly less sticker shock, though still pretty pricey, are the $500 Westone W40. That princely price tag gets you a spoil of goodies, including 25 dB of passive noise attenuation and a still-absurd array of four balanced armatures. 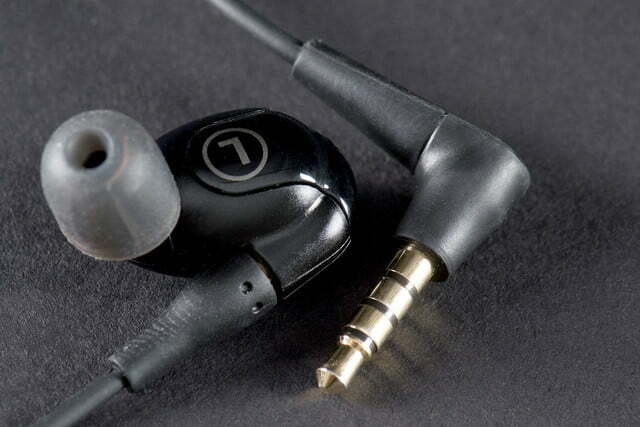 We recently took a luxury ride on the W40 express to find out what a $500 in-ear headphone could do for our portable music catalog, and in the interest of brevity, we’ll tell you now: It can do a hell of a lot. The W40 come in a premium package that gives their owner some immediate consolation for spending half a grand on a pair of in-ear headphones. Coaxing the inner package from its cardboard shell was a bit of a chore, but once we did we were rewarded with a smooth, charcoal-grey box with a magnetically-sealed cover that opens like a hardcopy book. Inside, a layer of thick foam held the black buds in place, with a detachable cable running in ribbons around the top of each bud before disappearing into the bottom layer. Beneath the earpieces we discovered two hard-shell jackets in red and blue that clip over the W40’s glossy ‘W’ logo to give the buds a touch of color. 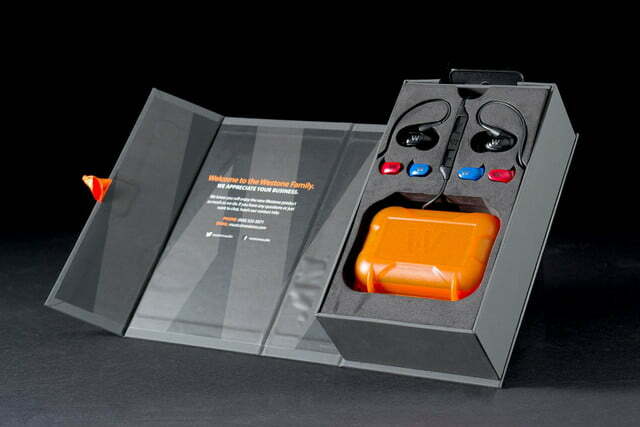 Below the phones we found a seriously heavy-duty plastic carrying case in orange that Westone calls a Monitor Vault. The ‘vault’ comes with a pressure release valve, heavy plastic clamps and is built tough enough to survive a direct hit from a scud missile. 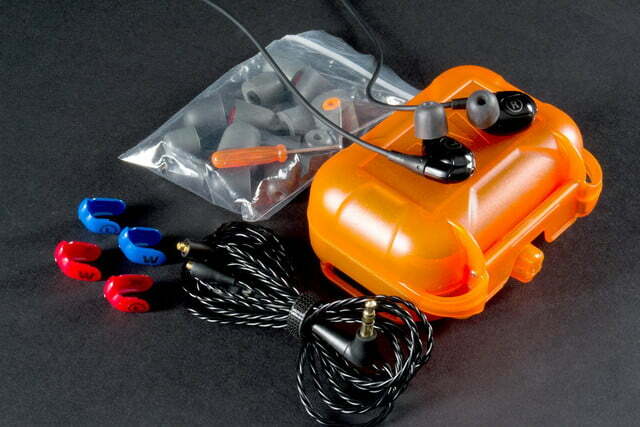 Packed tightly into the orange case we found a baggy loaded to the gills with silicone and Comply foam ear tips, a tiny hex screwdriver, and an ear-wax cleaner. Beneath that was a second removable cable, this one braided. A small packet of instructions at the very bottom of the W40’s box rounds out the package. 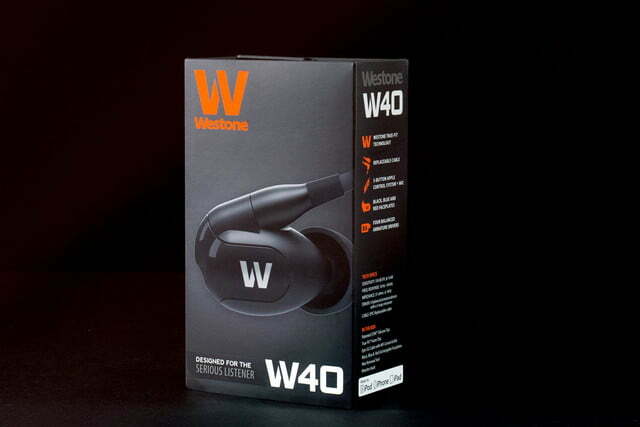 The W40 are sleek, lightweight buds, simple in form and built for utility. Their matte-black finish looks remarkably unassuming considering their lofty price tag. In other words, wearing them in public won’t provide you with any bling to show off – only you will know you’re an audiophile baller. 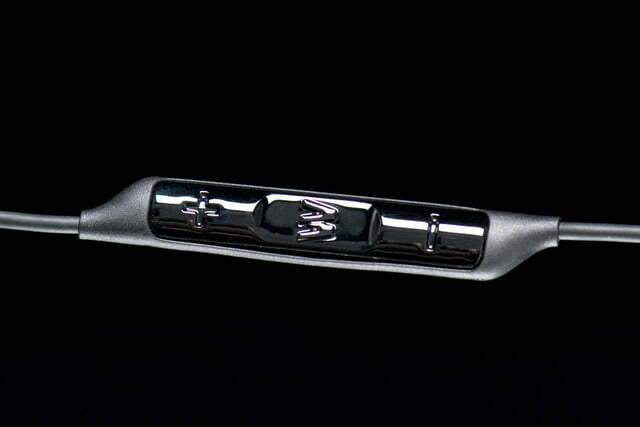 Beneath each bud’s innocuous plastic frame rests a mighty four-pack of razor-thin balanced-armature drivers. 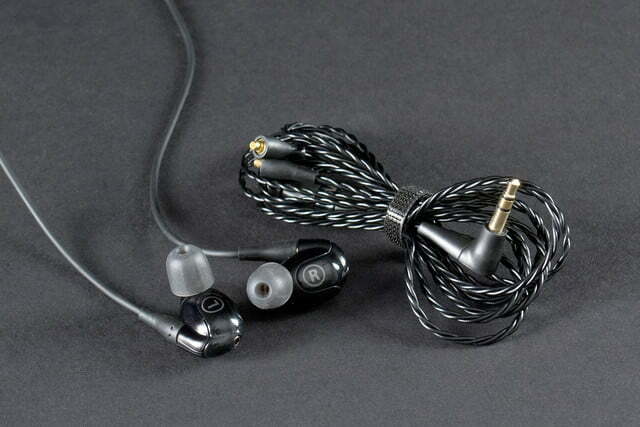 Inserting the buds into the ear is done in the same fashion as professional in-ear monitors: by circling the cable over the top of the ear and flipping the bud around to fill the entire canal for a snug and secure fit. 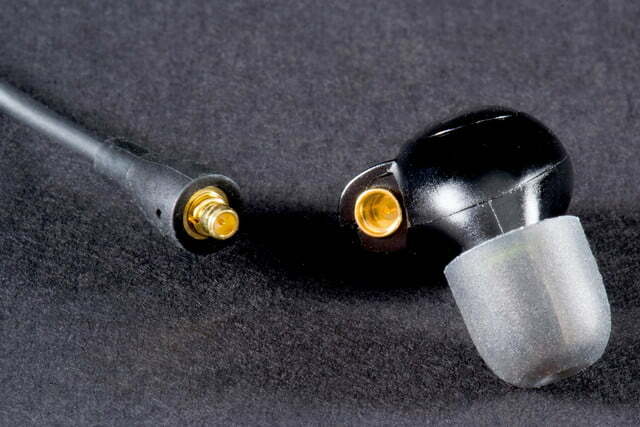 The earpieces come equipped with silicone eartips preinstalled, but they can easily be swapped out for one of the many Comply foam tips. The foam tips will add a bit more noise attenuation, but they also sprinkle some cloud cover over the sound signature. The ‘phones come attached with a straight iOS-compatible cable, complete with a slim three-button mic piece that rests about six inches down from the right earpiece. The secondary cable is braided, and does not include a microphone, but sports an adjustable ring to bind the forked extensions together. The cables attach to the buds at an arm that extends from the top of each, snapping into the small gold input via tiny gold insertion pegs. 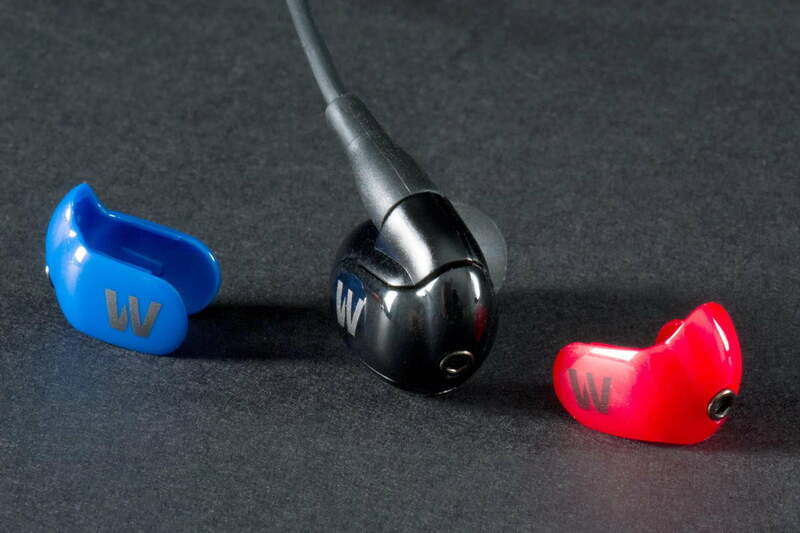 As mentioned, the W40 also includes small faceplates in blue and red, which screw into a small hex input at the back of each earpiece. To be honest, we had no real interest in adding color to the buds in the first place, but we think users who do will find the process fairly simple, as long as they remember to remove the original black faceplate first, instead of capping the colored plates over the top as we’ve seen in similar configurations. Beneath each bud’s innocuous plastic frame rests a mighty four pack of razor-thin balanced-armature drivers. The drivers are separated by three crossover points for bass, midrange, and treble, with a claimed frequency range of 10Hz to 18kHz. 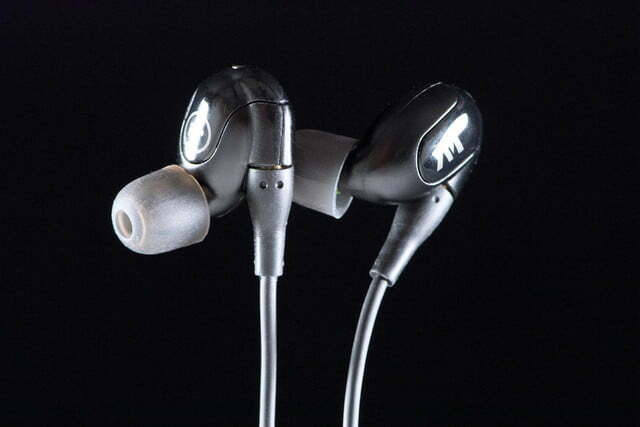 The W40 fit very snugly, and that helps them achieve their impressive amount of passive noise attenuation. 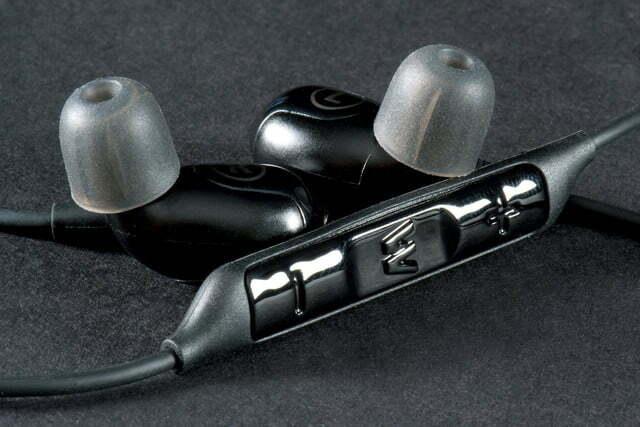 Westone claims the W40 knock off 25 db of noise, and we’re inclined to agree. Comfort will obviously vary for each person, but once we found the right ear tip for us, the W40 were as comfortable as any bud we’ve evaluated. Fortunately, the included accessory pouch offers just about every size imaginable. The foam tips were harder to insert and more invasive, but they also stayed put with an iron grip, which could come in handy in more tumultuous environments. While the W40 could be used in a number of scenarios involving premium electronics and high-quality source material, we think many folks will use them with their smartphones to play back MP3s. So that’s how we tested them: MP3s via an iPhone 5. Having done so, we can honestly say that, degraded source file or no, the W40 provided unbridled clarity, vivid definition, and miles of dynamic expression, reminding this reviewer, once again, that he truly does have the best job on the planet. Serenely ringing sweeps of an acoustic guitar, or swelling bows from a set of violins often surprised us with their sheer beauty. The W40’s detailed sound is so supremely refined that it provided fresh explorations into some of our favorite tracks, creating that sought-after “new discovery” experience that makes old classics sound brand new again. The W40’s provide professional mixing-level clarity, and you could certainly use the W40 in that capacity, or as a live in-ear monitor. Every nuance, muttering vocal, double-tracked guitar, or fluttering sweep of dissipating reverb was laid out in nimble, pristinely separated corridors of the sound stage. But the W40 aren’t just accurate. We also found the word “beautiful” riddled throughout our evaluation notes. Serenely ringing sweeps of an acoustic guitar, or swelling bows from a set of violins often surprised us with their sheer beauty. When you’re enamored with the applause at the end of The Beatles’ “Bungalow Bill,” you know you’re dealing with an impressive set of headphones. The W40 also did well tracing the roots of each instrument in every recording, digging up the inherent colors within and reproducing them, albeit with a taste of the lighter, laser-sharp touch for which balanced-armature drivers are known. Not surprisingly, the W40 really only showcased their full potential on works with extremely complex, richly-layered dimensions from bands like Radiohead, Depeche Mode, and Stevie Wonder. For example, “Before Your Very Eyes” by Atoms for Peace sounded almost like a different track altogether. Brand new details came to life, and others that had only been a ghost of a sound, like the wave effect that whirls behind the top layers towards the end of the song, were pulled from the background and aired for the first time in the light of day. Of course, we do have a couple of nits to pick. As is common in an armature-driver system, the bass wasn’t always as potent as we wanted it, and occasionally there was just a shade too much sibilance up top, evidenced by an ‘s’ or ‘t’ in a vocal line, or a sharp snap on a snare. But those issues tended to occur only on our lightest or poorest recordings, and the W40 do an excellent job coaxing warmth and fluidity from a design that is often accused of sounding clinical or sterile. Also, with due appreciation for the W40’s superb sound quality, we think most folks will think they are priced a little high for an in-ear. Still, if you can swing it, they absolutely deliver. The W40 provided us with excellent noise isolation and brilliant portable audio compatibility, with sound quality that will only improve for those who do splurge on a premium playback device. After all, and if you’ve already thrown down $500 for premium electronics, why not go for the gold with the headphones, too? Westone’s W40 offer supreme clarity, ravishing detail, and astonishing dynamic expression, placing them in meager company within the hi-fi landscape. Their $500 price tag has a lot of bite, but then again, the work that goes into cramming four drivers into a tiny bud doesn’t come cheap. These are professional headphones, designed for serious audiophiles and musicians – casual listeners need not apply. But if you want an in-ear that gives you a whole new way to explore your aging audio collection, Westone’s W40 may be the set you’ve been waiting for.